Microsoft has taken a step further on its support for the Apple Watch by updating its Outlook app for iPhone. If you already use the Outlook app on iOS then it relatively does a pretty good job on the Apple Watch too. But the latest update brings with it major changes which will improve functionality on Cupertino’s new wearable. Prior to the latest update, Outlook users were limited to receive basic notification messages with no adequate interactivity. In the latest Outlook update for iOS, the Watch app now shows more of the email body and even provides the ability to reply to those messages. 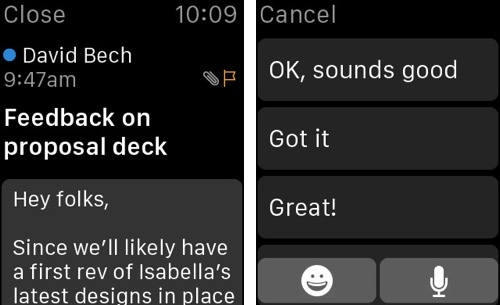 Microsoft has updated the Outlook app for the Apple Watch with a more native feel. Let’s dive in to see what changes are part of the update. The update makes the Outlook app way more functional than before. Once you have installed the update, you can now see incoming emails, access for upcoming appointments on the calendar, rich notifications with more of the email body and the functionality to interact with those notifications. With more of the message body in view, users can now decide on an initial glimpse whether or not to open an email. You can also respond to emails with handy messaging tools like canned responses, use of emoji, and if this isn’t relevant enough, you can always dictate your own message using Siri. Other than the inbox management, Outlook update for iOS also features a new Glance on the Apple Watch. The Outlook Glance on Apple Watch shows an overall view of the inbox that shows read and unread emails. The information for upcoming events for the day on the calendar is also provided on the Outlook Glance. This makes it quite easy to schedule events with the least effort. Get a quick glance of what’s happening in your Outlook Inbox or what’s next in your calendar just by swiping up from the Watch face. Just try it, you’ll love it. Need more context? Catch up with unread emails during your busy day right from the Outlook Watch App. When it’s really urgent, just reply directly from your watch with the set of replies we’ve pre-written just for you. We also have emojis and voice dictation if you’re more than kind of person. Never miss what’s really important to you. Get notified of important emails and take action immediately thanks to our custom notifications. Archive that. Schedule this for later. It’s easy as 1, 2, 3. A dimension has been opened for the Apple Watch in terms of email management. Maybe other third-party developers can also use the same framework for more apps and provide more functionality for Apple Watch users. Those of you interested can download Microsoft’s Outlook for iOS directly from the App Store for free.